When it comes to the various nanowidgets scientists are developing, nanotubes are especially intriguing. That's because hollow tubes that have diameters of only a few billionths of a meter have the potential to be incredibly useful, from delivering cancer-fighting drugs inside cells to desalinating seawater. But building nanostructures is difficult. And creating a large quantity of nanostructures with the same trait, such as millions of nanotubes with identical diameters, is even more difficult. This kind of precision manufacturing is needed to create the nanotechnologies of tomorrow. Help could be on the way. As reported online the week of March 28 in the journal Proceedings of the National Academy of Sciences, researchers at the U.S. Department of Energy's Lawrence Berkeley National Laboratory (Berkeley Lab) have discovered a family of nature-inspired polymers that, when placed in water, spontaneously assemble into hollow crystalline nanotubes. What's more, the nanotubes can be tuned to all have the same diameter of between five and ten nanometers, depending on the length of the polymer chain. The polymers have two chemically distinct blocks that are the same size and shape. The scientists learned these blocks act like molecular tiles that form rings, which stack together to form nanotubes up to 100 nanometers long, all with the same diameter. "This points to a new way we can use synthetic polymers to create complex nanostructures in a very precise way," says Ron Zuckermann, who directs the Biological Nanostructures Facility in Berkeley Lab's Molecular Foundry, where much of this research was conducted. Several other Berkeley Lab scientists contributed to this research, including Nitash Balsara of the Materials Sciences Division and Ken Downing of the Molecular Biophysics and Integrated Bioimaging Division. "Creating uniform structures in high yield is a goal in nanotechnology," adds Zuckermann. "For example, if you can control the diameter of nanotubes, and the chemical groups exposed in their interior, then you can control what goes through—which could lead to new filtration and desalination technologies, to name a few examples." The research is the latest in the effort to build nanostructures that approach the complexity and function of nature's proteins, but are made of durable materials. In this work, the Berkeley Lab scientists studied a polymer that is a member of the peptoid family. Peptoids are rugged synthetic polymers that mimic peptides, which nature uses to form proteins. They can be tuned at the atomic scale to carry out specific functions. For the past several years, the scientists have studied a particular type of peptoid, called a diblock copolypeptoid, because it binds with lithium ions and could be used as a battery electrolyte. Along the way, they serendipitously found the compounds form nanotubes in water. How exactly these nanotubes form has yet to be determined, but this latest research sheds light on their structure, and hints at a new design principle that could be used to build nanotubes and other complex nanostructures. Diblock copolypeptoids are composed of two peptoid blocks, one that's hydrophobic one that's hydrophilic. The scientists discovered both blocks crystallize when they meet in water, and form rings consisting of two to three individual peptoids. The rings then form hollow nanotubes. Cryo-electron microscopy imaging of 50 of the nanotubes showed the diameter of each tube is highly uniform along its length, as well as from tube to tube. This analysis also revealed a striped pattern across the width of the nanotubes, which indicates the rings stack together to form tubes, and rules out other packing arrangements. In addition, the peptoids are thought to arrange themselves in a brick-like pattern, with hydrophobic blocks lining up with other hydrophobic blocks, and the same for hydrophilic blocks. "Images of the tubes captured by electron microscopy were essential for establishing the presence of this unusual structure," says Balsara. "The formation of tubular structures with a hydrophobic core is common for synthetic polymers dispersed in water, so we were quite surprised to see the formation of hollow tubes without a hydrophobic core." X-ray scattering analyses conducted at beamline 7.3.3 of the Advanced Light Source revealed even more about the nanotubes' structure. For example, it showed that one of the peptoid blocks, which is usually amorphous, is actually crystalline. Remarkably, the nanotubes assemble themselves without the usual nano-construction aids, such as electrostatic interactions or hydrogen bond networks. "You wouldn't expect something as intricate as this could be created without these crutches," says Zuckermann. 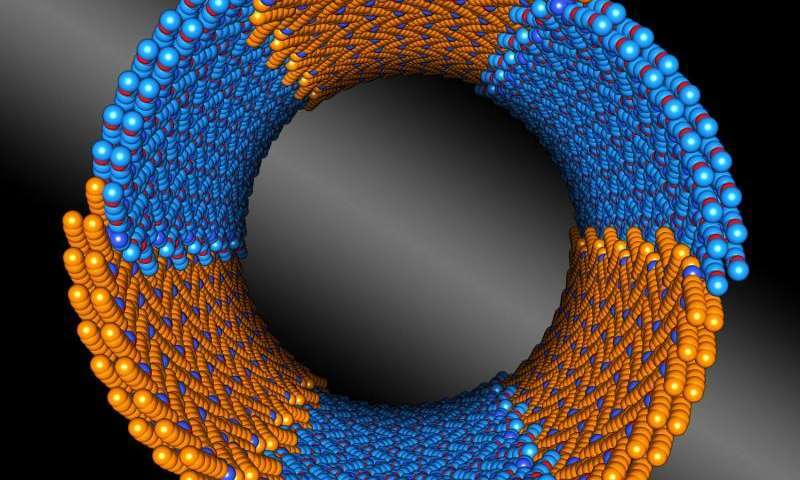 "But it turns out the chemical interactions that hold the nanotubes together are very simple. What's special here is that the two peptoid blocks are chemically distinct, yet almost exactly the same size, which allows the chains to pack together in a very regular way. These insights could help us design useful nanotubes and other structures that are rugged and tunable—and which have uniform structures."